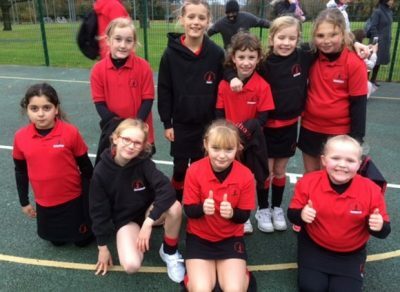 The squad of Amelie, Belle, Gabriella, Lowenna, Tayla, Amelie (C), Emelia, Katie and Mona played a very competitive and sporting match at home against BHHS. The girls got off to a ‘flying start’ by scoring three very good goals. In the second quarter they extended their lead to five goals and defended really well so BHHS were not able to score. In the penultimate quarter BHHS managed to score two goals but they had left it too late to overcome Copthorne’s determination to win the match and the final score was a home win of six goals to two. I was very impressed with their team work and team spirit which helped them to achieve a good win. Some great goals by Gabriella and Tayla helped as well! Well done the U9B team and congratulations to Tayla for being selected Player of the Match by BHHS.